Yoga Posture of the week! 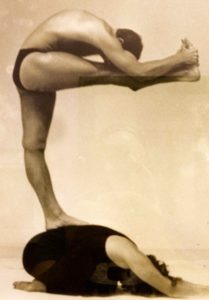 The Barkan Method Hot Yoga Posture of the week! Barkan Method, one of the original Bikram Yoga College of India’s opened in South Florida, Fort Lauderdale in 1983 & Boca Raton in 2012!! We offer Hot Yoga Warm Yoga Yin Yoga Ashtanga Yoga Power Yoga 365 days a year! Beginners: The key or what I call the “primary thought” for the beginner is the standing leg. I like to use the term straighten your leg instead of lock the knee. To lock the knee may imply hyperextension. Hyperextension could cause injury to the knee. Lift the thighs (quadriceps muscles) and keep your weight forward toward the big toe mound to protect the knee. If you are nursing a back injury or not able to hold your foot, hold your knee. (Always consult your teacher before doing a modification). If you can hold your foot, grab just below the ball of your foot. Keep the knee of your upper leg just above the waist. I find many students position their upper body too low. This puts too much strain on the lower back. Your goal is to extend your upper leg out only one inch at a time. By dropping your shoulders and straightening your arms you’ll create a full range of motion behind the (hamstring) upper leg. Intermediate: Loosen wrists!!! I have mentioned in past newsletters the infamous “death grip”. Students hold on the foot so hard that their wrists tighten and protrude. At the beginning level it can help in holding the foot. The problem with the “death grip” is at the intermediate level. It’s time to drop the shoulders, wrists and elbows without holding on too tight with the wrists. You must relax the shoulders, elbows and especially the wrists by letting them drop down to accomplish this! Another mistake at this level is dropping the upper body down to touch the forehead to the knee. This promotes a flat back and shifts your center of gravity to far forward. Instead, tighten the abdominals and round the spine (like the rabbit pose). Without dropping the upper body, curl your head onto your knee so that your stomach doesn’t touch your thigh. Advanced: Your primary thought at this level is “keep your upper thigh muscles engaged”. This will insure your balance as you achieve and maintain the pose. Work on getting your elbows below your calve muscles by dropping your shoulders down. Make sure your upper foot stays vertical. Just about everyone has a tendency to turn the foot out. Rotate your ankle and turn the foot upright. Ultra Advanced: Touching your forehead to the knee is not the final destination. Letting go of the foot is the ultimate experience. Below is the exact formula to help you achieve this goal: After obtaining the full position, lower your hands down to your heel, with your right hand let go of your foot and extend your right arm out toward the front wall parallel to your outstretched leg, fingers together, palm facing to the left. Then extend your left arm out toward the front wall, parallel to your outstretched leg, fingers together, palm facing toward the right. Look ma no hands! Your upper thigh will burn and cramp at first. Be patient!